The Switchboard is the first window you should explore in pdfToolbox Desktop. It provides easy-to-use versions of much of the technology embedded in pdfToolbox; it doesn't always allow you to do more complex things, but it's a great way to explore what is possible and which things can be done. This article describes how the Switchboard works and what you do with it. To open the Switchboard if it is not visible, use the "Tools" > "Switchboard" menu item. Use the "Back" button to go to the previously displayed part of the Switchboard. This functions exactly like the "Back" button in a standard web browser. Use the "Home" button to go to the home screen. The home screen is the screen shown in the above screen grab, which lists all of the groups of functionality in the Switchboard. Use the pull-down menu at the top of the Switchboard to change to a different library. Libraries make more sense in the contents of profiles, checks and fixes and are further described there. The "Search" button opens a search field where you can locate Switchboard items by their name or description. The "Action" button in the top right corner provides a different way to work with libraries. To use a particular functionality in the Switchboard, drill-down to it by clicking on the Switchboard buttons. Click on the "Arrange" button to open the Switchboard pane showing all of the imposition related functionality. Each button here leads to an action. Click on the "Step & Repeat" button to open the Switchboard pane for the "Step & Repeat" action. Each action pane in the Switchboard features a short description. This is particularly useful when you are browsing the Switchboard as it can help to quickly understand what each action does. Depending on the action you have selected, options may appear on the Switchboard pane; use those to configure exactly how you want the action to be performed. Each Switchboard action pane contains an "Action" button. This button contains specific functionality for that specific action. The "Execute" button can be used to run the Switchboard action on the currently displayed PDF document. The "Batch..." button allows you to choose a folder and run the Switchboard action on all PDF files in that folder. This is not the same as a hot folder scenario as only the files already in the folder will be processed (See the article Working with hot folders in pdfToolbox Server for more information on actual hot folder functionality). The following is a short overview of what you can find in the Switchboard. Given how accessible the Switchboard is, you are strongly encouraged to browse through it and try out things. Functionality related to impositioning. This group contains both easy to use imposition functionality (n-Up, Step & Repeat, Booklet ...) and gives access to the "Impose" action which allows using the full imposition engine (using text-based configuration files that control the imposition). A number of actions that could be useful when working with (PDF versions of) presentations, adding transitions to slides, creating hand-outs and more. This group contains the most commonly used preflight profiles (read more about preflight profiles in the article Profiles: the corner stone of pdfToolbox) from the ISO and the Ghent Workgroup. Common prepress fixes such as flattening transparencies, fixing hairlines, adding correct trim marks or page boxes. This group also contains actions regarding CxF (color exchange format) data in PDF documents. This group features conversions from other file formats to PDF (office files, PostScript, EPS, images) and from PDF to other file formats (images, PostScript, EPS). Other actions add information (overlays or letter heads) or work with embedded files. The main focus here are actions that change the page format, either by modifying the page boxes (media, trim, bleed...), by modifying the page content, or both at the same time. Page rotation and mirroring can also be found here. These Switchboard groups focus on working with that particular type of PDF functionality. 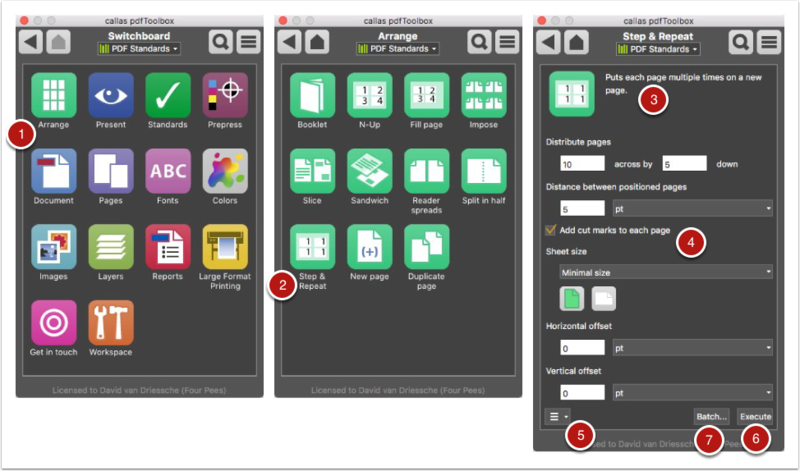 To help with understanding how PDF documents were constructed, pdfToolbox can create reports of fonts, color spaces, images... used in the PDF document. To learn more about understanding troublesome PDF documents, read the article Analysing problem files. 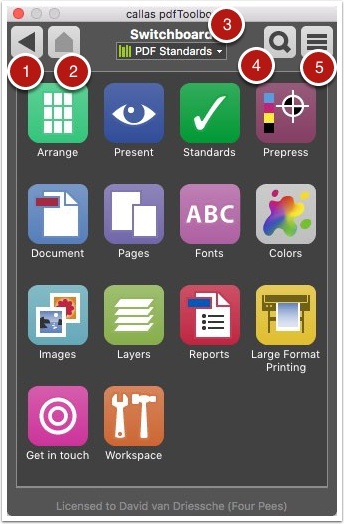 This group contains a number of actions that focus on job finishing for large format printing. Included are adding white space and bleed, placing grommet marks, adding additional ink layers (such as white or varnish) and creating tiles of large documents such as billboards. The actions in the get in touch group provide links to support and tutorials and provide ways to get in touch with feature requests and technical questions. This is an area of the Switchboard you can customise by including your own actions, profiles, checks or fixups.